« Jet Wake Turbulence: Distance Ain’t Enough. Jet Runways: The Long and Short of It. And that’s what it looks like, landing a jet on a short field which, for a transport category jet, John Wayne-Orange County (SNA) certainly is. But the video tells nothing about how it’s done, much less how it’s possible. Besides, landing is the easy part–taking off, unless you plan to spend the rest of your life there, is the complex and more difficult maneuver. So here comes a discussion of the long and short of it. The wily flight engineer had to enter the graph with the jet’s landing weight, speed, the airfield pressure altitude and compute the millions of foot-pounds of brake energy that much be dissipated after touchdown. See why? It’s all about choices: on landing, you have a choice that you don’t have on take-off, which is, don’t stop. On landing, you’re in flight and can continue–go around, divert, find a longer runway; set up for a different approach. On take-off, you don’t have the option of continuing a flight you have yet to achieve, and you’ll be likely to be much heavier on take-off (fuel, which gets burned off enroute, right?) than on landing, minus one key option–staying in the air. You have to stop. And on many runways, you have little space in which to do that. So you’ve seen the primary challenges: weight, speed, and distance. Now for the wild cards, which are tailwinds and runway surface conditions. If you are at your threshold speed, say 150 KIAS (Knots Indicated Airspeed), but the wind is directly on your tail at 5 to 10 knots, your tires will hit the runway at 155 to 160, and the brakes will have to absorb the kinetic energy associated with that, not the 150 threshold speed. The Byzantine brake energy chart above assumes a standard coefficient of friction, but if the runway is wet or worse, the coefficient of friction will be reduced as will brake effectiveness. And now let’s throw in the hardware curveballs: what if one or both reversers fail to deploy? Or if an engine fails, that reverse thrust is lost as well. And if the wing spoilers fail to deploy, or the antiskid fails, or any tire blows, reducing your braking capacity by 25% per tire. These are all contingencies that must be dealt with, and on take-off roll on a short runway, they come at you fast because you’re using a higher power setting to lift more weight of the short runway: faster acceleration means less reaction time before you’re committed to flight because stopping in the runway remaining isn’t possible. Mexico City has a 12,000 foot long runway–more than twice the length of the SNA runway–but at 7,500 feet on a good day; if the temp hits 90, as it often does, MEX becomes an engineering nightmare for stopping and for taking off. Ditto Denver International. And (told you it was more complicated) if you’re not taking off but rather trying to abort on the runway, with any of the variables, wild cards and curveballs above, you’ve got a real mess on your hands. So how is it done? It all goes back to being a junior high school boy, when the primary question in life was this: how much can I get away with? Calculate the predicted landing weight–takeoff weight minus enroute fuel burn–then determine the “Landing Distance” we’ll require. The bottom three lines include the degrade factors for tailwind and no reverse thrust–have to add those factors as well. Keep that number in mind to recheck before descent: if we’ve burned more fuel than planned, the margin gets better. If we’ve saved fuel by favorable winds or routing, the figures are wrong. Plus, we really won’t know for sure if the runway is dry, wet or icy until we’re much closer in. 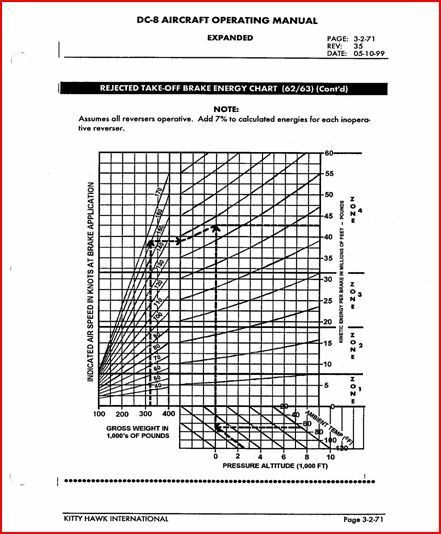 Aircraft manufacturers, in compliance with FAA standards, have computed the Landing Distance chart very conservatively: they figured only about 75% of the actual brake effectiveness; they normal include zero reverse thrust. Boeing jets have excellent autobrakes which can smoothly and easily apply Max braking, and do it evenly: if you’re landing with a lot of rudder input, you’ll have one leg extended and one bent back–try applying both pedals equally then. And antiskid computers apply the braking evenly on both gear until sensing an incipient skid, keeping the pressure just below that point, something humans can’t really perceive. So, on landing, know before the wheels come down on final what the maximum weight for conservatively landing on a runway is, plus the adjustments to make in your head for the variables of winds and runway surface conditions. It’s best to have as wide a margin between our weight and the max, the most realistic, with conservative additives, estimate of what the jet and the runway can handle. Takeoff is a similar max calculation, with a twist: what’s the maximum speed to which you can accelerate and still stop in the remaining runway? Same wild cards, curveballs and technical factors in play: winds, runway surface, equipment failures–including those that help us go (engines, high lift devices, flight controls) and those that help us stop (hydraulics, engines, reverse, tires, brakes, antiskid, electrical power). Again, it’s coming at you fast on take-off roll because you’re accelerating and using maximum power for the adverse conditions. In the split second of a go or abort decision, you’d better discern if what you’re aborting for will compromise your ability to stop (see parenthesis in the above sentence) or eliminate your ability to fly–and you’d better be right. LaGuardia, just prior to brake release. Prior to applying takeoff power, review for myself the abort procedures that you must correctly do in the proper sequence (throttles idle, speed brakes, reverse thrust, brakes) and the dividing line: after 70 knots (considered the high speed-low speed dividing line), we’ll abort only for the mandatory items, which you also have memorized. So we don’t even release the brakes till we have the big numbers pow-wow: planned weight, actual weight; takeoff power setting, N1 engine reading, V1 speed. You have to see it on the paper copy, on the glass (the FMS control head), on the flight management display (same numbers) and the Primary Flight Display, which is also repeated in the Heads Up Display projected on the glass in front of your face. Now we’re ready to go–or, stop, as the case may be. Clear your mind of everything but the important stuff, know where you are in relation to each factor as speed increases and runway decreases, and be prepared to recognize developing situations and the proper options to handle them. And that’s the long and short of jets and runways. Let’s go fly. This entry was posted on January 26, 2013 at 4:53 pm and is filed under air travel, airline, airline pilot blog with tags a day in the life of an airline pilot, air travel, airline captain, airline pilot blog, airliner, airport, aviation, flight engineer, pressure altitude, short runway, take-off abort. You can follow any responses to this entry through the RSS 2.0 feed. You can leave a response, or trackback from your own site. Great Post Chris 🙂 Just wanted to ask, What’s the maximum number of attempts you have taken to land a plane? I mean max. Number of Go Arounds on one occassion? I don’t keep track, but my rule of thumb is you won’t see anything on a third approach that you didn’t see on the first two. A third approach is a waste of fuel you’ll need for a divert. I go with the theory that if you’ve done a second go-around, there’s probably something you don’t know or haven’t seen yet that’s causing a problem, so it’s best to go elsewhere. It would be rare for me to do a second approach, although I have done one, then gone off to hold till a fast-moving weather system cleared the field. Most typical is a go-around because of a spacing problem. But the idea of approach after approach? makes no sense and I don’t know anyone who’d do it. There’s always a better option nearby. Thanks for this post Captain. Your inside info to us non-pilot aviation geeks is very interesting. 1. How do you determine your setting on the auto-brake system? 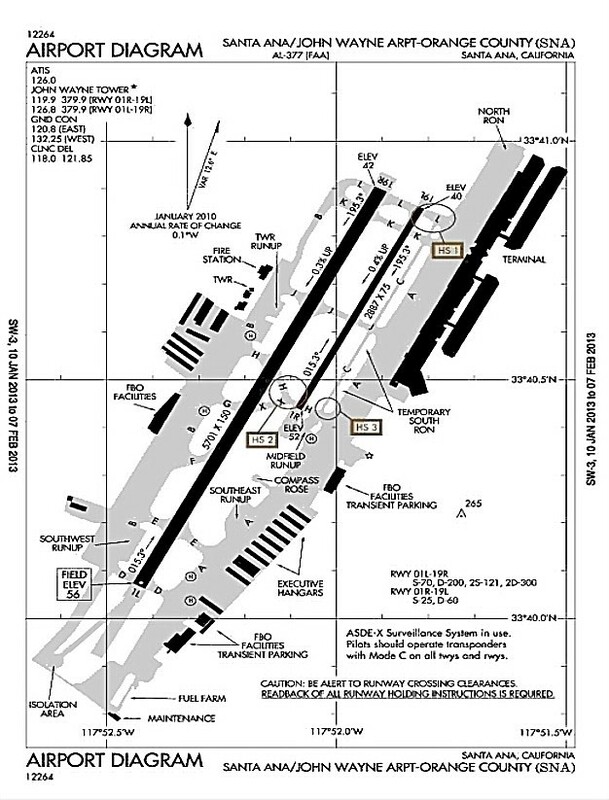 I assume runway length and condition has a lot to do with it, but is there any pilot preference figured into it? 2. On landing what point in the runway are you aiming for? Does that change based on the length of the runway? The two large rectangles you see near the approach end in the video are the touchdown target. We call them the captain’s bars and they’re located where a standard glide path (3 degrees to 3.5 degrees, depending on the airport) would carry you. Standard practice is to touchdown between 800 and 1,500 feet from the arrival end, but never more than 1/3 of the runway length. Autobrakes have some standard practices too, mandating their use on shorter runways and under a couple of other circumstances, with the setting being appropriate to the runway length. In Orange County, I always use 3, or if there’s any hint of a tailwind, Max. But landing is always permitted without the system if it’s inoperative. I like to use auto brakes because especially at higher settings, the system applies braking smoother than I can. My aim point never changes, long or short, so that when I land on short runway it’s just a standard aim point for me. Another excellent post, thanks! And it pays to read the comments! I too have wondered how the PF selects the auto braking force t o b e used. Your response to Tom nailed it. The auto brake and anti-skid features are slick inventions to ‘un-slick’ your runway! I am a new follower of your blog and as a flightsimmer, I have to say it’s very educating to read your posts. I never thought of take-offs as far more critical than landings, but the way you explain it makes it very obvious. I would be very content having you as captain of the plane I’m flying as passenger. Thank you from Europe and keep up the good work! I always hated the Noise Abatement TO at SNA. One of these years they’re going to be cleaning up 120 tons of aluminum when they do the Back Bay Cleanup. That’s a very apt description. Takeoffs aren’t quite as drastic in the 737-800. The old MD-80 power cut for noise was really dramatic. The -800 is quiet enough that we do a constant angle climb, no power cut. We use flaps 25 pretty much standard, and 27K power which we only use there and DCA. You can request flaps 15 and the numbers work. Some F/Os don’t like flaps 25, so nose high in the event of an engine failure, and if they express that when it’s their takeoff, I say fine, pull up flaps 15 data and we’ll go. I have no problem with 25 on my takeoffs, but I respect other pilots’ preferences to the extent that it doesn’t interfere with the flight. I’m usually on a 75 with that max performance TO. Full run up, release, scream down the runway and yank the nose at the last second. Then 29 degree climb to 1200 foot, pull power until it feels like a flat bottom boat on a small pond until you’re out over the ocean. As much as I’ve flown that’s one TO that gets to me. We do a static takeoff too, as in DCA LGA SAN. No runway to waste setting power. I see UPS and FedEx in there too with big Airbuses putting on quite an airshow on departure. When we first started flying MD80s out of there in the 1980s, our chief pilot nearly had a stroke on the demo. I like the way we can get in and out of there in the -800. So much power that we do transcons out of DCA off that short runway. Even with a transcon fuel load, we can still climb immediately to the upper 30s. Next time you’re there, spend a little time on the parking structure across the freeway next to the Skypark area. When the heavies land you can hear the vortices swirling by 30 seconds to a minute later. Very freaky!